Vladimir Putin’s intervention in the U.S. election is and will continue to be a matter of controversy because we don’t know all the facts and therefore the full extent of what his government did (nor do we know the extent to which the U.S. intelligence community’s reports and leaks are devoid of political intention). But we do have the full facts about Putin’s evildoing in Syria, and we should not forget them. To put it very simply, Moscow is the reason why Bashar al-Assad, that blood-thirsty tyrant, has pretty much won Syria’s internal war. Two foreign interventions have been decisive in turning what was an unsustainable situation for Assad’s regime into its current condition, which, despite the ongoing fighting, virtually guarantees that he will remain in power in the foreseeable future. One is Iran or, to be more precise, the myriad Shiite militias that are in Iran’s orbit, including Hezbollah, the Lebanese organization; Badr, the military wing of an Iraqi political party; and the Fatimid Brigade, an Afghan group. Tehran’s Revolutionary Guard helped Assad set up a structure of Syrian militias that runs parallel to the regular army and was decisive in Syria’s ability to take back significant swaths of land and key cities such as Aleppo. The other factor was Moscow. Russian forces have supported Assad directly for more than a year. The ties between Russia and Syria, of course, go back to the Soviet Union, which kept a naval base on the Syrian coast and was the main supplier of weapons to that country’s army. 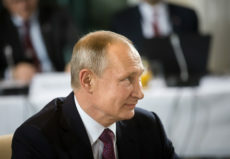 Putin’s intervention has not been limited, as many observers think, to providing air power to Assad, although that has certainly been a crucial part of the operation (and the cause of some atrocities). Putin has also trained and equipped the Syrian forces, and tested his technology in the Syrian theater of war. What did Putin want, essentially, in Syria? His main goal was clearly to weaken, and hopefully destroy, the moderate, legitimate opposition to Assad, which he saw as dangerously close to, and dependent on, Western aid and political support. In a sense, then, when the first Russian airstrikes took place in September of 2015, his goal was to strengthen the very enemy he publicly maintained he wanted to obliterate—the terrorist Jihadists. By doing this, he would ensure the United States and Europe were faced with almost equally unpalatable options, i.e., accepting Assad’s rule or undermining him to the benefit of the Jihadists. And this is precisely what he accomplished. The legitimate opposition is now very weak and politically isolated. Given the new situation, in which the Russian-backed Syrian forces face primarily a Jihadist enemy, Moscow has managed to strengthen its connection to other governments that dread the spread of Jihadism even if they used to have tense, or even confrontational, relations with Moscow. Israel and Turkey are two perfect examples. Geopolitics aside, the truth is that the war has been going on for five years, that as many as half a million people have been killed, that half the country’s population has been displaced, and that the Assad dynasty responsible for a monstrous reign of terror since 1970 is still solidly in place. Putin’s contribution to this state of affairs has been decisive. His many acts of barbarism outside of Russia’s borders (not to speak of the ones he has committed within those borders), from his intervention in Georgia to the annexation of Crimea to the invasion of eastern Ukraine to the cyberattacks and a possible intervention in the U.S. election, make for a horrific foreign policy record. But none of them surpass his evildoing in Syria.